Initiating a dialogue between the network of women’s museums and feminist practices in curating, this volume gathers different perspectives from art historians, artists, curators, educators, historians, human rights activists, museum directors, researchers, scholars, and theorists. 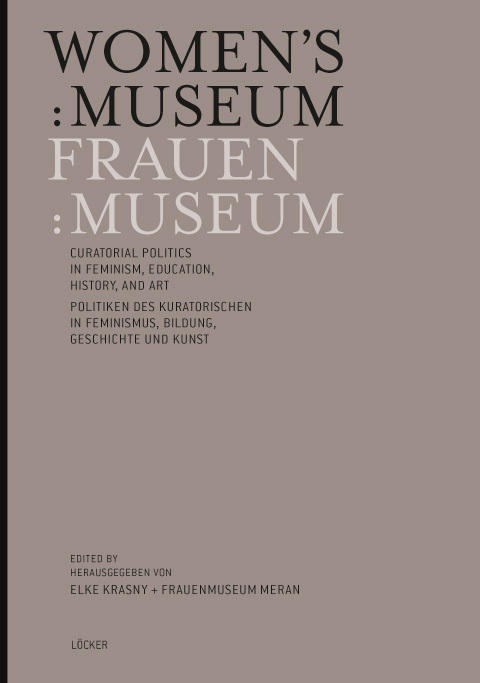 It juxtaposes essays, interviews, email dialogues, and excerpts from the transcripts of two symposia on Women:Museum hosted at the Vienna City Library and at the Meran Women’s Museum. Resulting in a contemporary transnational historiography, this compendium charts issues of feminist strategies in and out of the museum, and examines public engagement through curatorial activism. Contributors | Mit Beiträgen von: Gudrun Ankele, Vida Bakondy, Barbara Blasin, Carla Bobadilla, Angela Dimitrakaki, Petja Dimitrova, Elisabeth von Dücker, False Hearted Fanny, Nicoletta Favout, Eva Geber, Li Gerhalter, Susanna Gyulamiryan, Daniela Hammer-Tugendhat, Amelia Jones, Elke Krasny, Rudolfine Lackner, Igor Markovic, Suzana Milevska, Lara Perry, Stefania Pitscheider Soraperra, Sigrid Richter, Dorothee Richter, Astrid Schönweger, Mansoureh Shojaee.